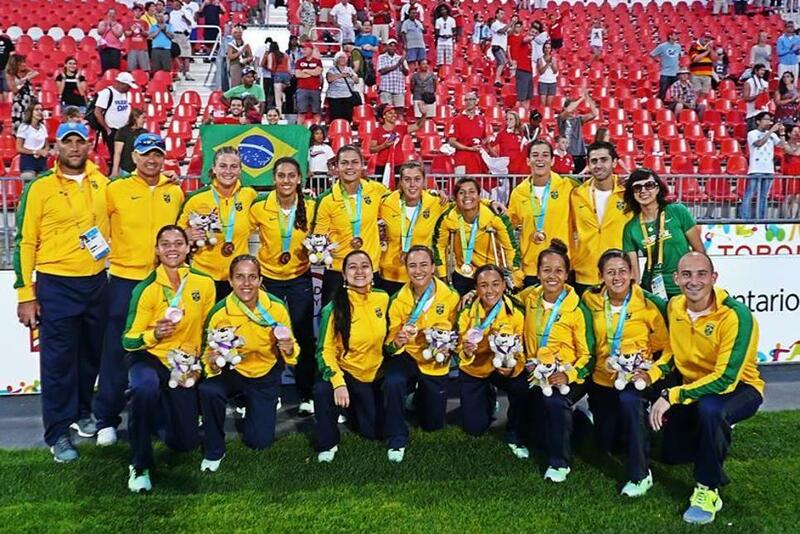 Brazil's Marjorie Enya has bold ambitions for what she believes can be achieved in women's rugby in South America, and is determined to put her passion for the sport and her World Rugby Women's Leadership Development Scholarship to good use. Marjorie Enya is a busy woman. Since learning in May that she would be awarded a World Rugby Leadership Development Scholarship, the Brazilian has travelled to San Francisco to work at July’s Rugby World Cup Sevens and last month was in Buenos Aires to attend the IOC Olympism in Action Forum on the sidelines of the Youth Olympic Games. Those commitments have had to be balanced with her work for the Olympic Research Group, based at the University of Sao Paulo, and her activities with the Development Committee at the Confederação Brasileira de Rugby (CBRu), where she is the first elected female athletes’ representative on the Board. This meant that her plans for her scholarship had been placed on the back-burner, but since returning from Argentina she has focused on such activities, discussing some possibilities with her mentor Sue Day – the Rugby Football Union (RFU) Chief Financial Officer – and World Rugby General Manager of Women’s Rugby Katie Sadleir. “I will be focusing on social development through rugby, which is something aligned to my values and possibly a good strategy to grow the women’s game in the region,” Enya explained. Although she may only now be able to devote her full attention to the scholarship, the Brazilian has some bold ambitions about what she might be able to achieve in South America with World Rugby’s backing. “When it comes to leadership positions, opening up space at the Board level (for women), that’s the thing that no-one’s actually talking about,” explained Enya, who will also attend the Women in Rugby Conference in the USA in December. “And I think it’s very bold of World Rugby to not be following down that path, and setting up an example and saying ‘it is possible, and we’re going to do it’. I do believe it’s going to come with amazing, amazing results. “I think the challenge for South America, which is what I’m trying to tackle more directly, is not so much the access but the inequality in terms of funding and attention given to the women’s game. “I have just found that regardless of the size of your union, all the money that comes in has already got a specific destination to it. And it’s not good, it’s not bad, it’s just how it is. “And with women’s rugby being relatively new in that sense, it’s hard for us to get more than adequate funding because we’re really the late-comers. Enya was, herself, attracted to the game by the camaraderie it offered. Having started playing in college, she soon explored club rugby and joined Sao Paulo Athletic Club (SPAC). Quickly, though, she says she realised she would not make the grade in a playing capacity with Brazil’s most successful women’s club and so, despite only being in her mid-20s, decided to step into the world of administration. “I met the most amazing women I had ever met,” she said. “But fortunately or not what ended up happening was I sucked so bad, but I just wanted to stay involved and there’s a lot of opportunities off the field as well. Enya began volunteering, working her way up through the regional federation to the CBRu where she became team manager of the women’s national team. Enya might not have cut it as a player but that did not diminish the feeling for the game she had developed, or what it has helped her achieve. “I’ve seen what rugby can do to women for women,” she continued. “I’ve seen the level of confidence, of solidarity, of friendship and loyalty, all that kind of stuff. I had never seen anything like it before rugby. “At first you think, ‘oh, this is something that’s part of my club or part of my group of friends’ but then the more you get to know people in rugby, the more you realise that actually it’s something of the sport, it’s part of its culture. “And that’s what kind of drives me, because what I feel about growing the game is that sometimes we take the values for granted. That drive to grow the game across her continent – Enya is determined to use her scholarship for good in all corners of South America – is something that former England captain Day picked up on. The Brazilian administrator will need all of the energy she clearly possesses as she attempts to tackle challenges that include social as well as funding barriers. “It’s completely different from growing the game in Europe, or in Oceania or even in North America,” Enya said. Enya is stringent in her belief that women’s rugby can be a vehicle for social change. “I’ve seen rugby create the right kind of environment for those things to be discussed in a respectful, friendly manner,” she added. Mexico took part in the opening round of the HSBC World Rugby Women’s Sevens Series 2019 in Glendale, USA, earlier this month, but in general Central and South American countries are a rare sight in elite women’s international competition. Of course, if Enya can help it the situation will look very different in the future. “I’d like to see a South American team – Brazil preferably – playing in the 15s World Cup, I would love to see us being one of the core teams in the World Series,” she said. “There are a lot of dreams you can have for high performance, but in a broader sense I would just love to see women and girls in the region given the opportunity to have their minds blown by rugby. “Of course, it’s important to nurture a successful national team, high performance clubs, etc, but growing the women’s game can’t be just about the tip of the iceberg, or about the flashy things that make the news.